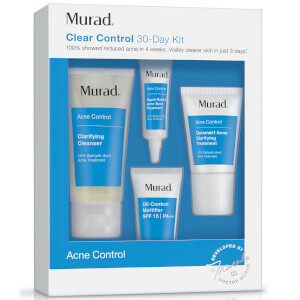 Show your skin who's boss with the Acne Clear Control 60 Day Starter Kit from Murad. Combining a range of essential skincare treats, the facial regime promises to fight breakouts, eliminate shine and soothe irritated skin. Helping to reduce shine on the face and control oil production, the mattifying formula combines Willow Bark with Argan Extract to manage breakouts and clear the skin of impurities. Skin will look and feel softer. 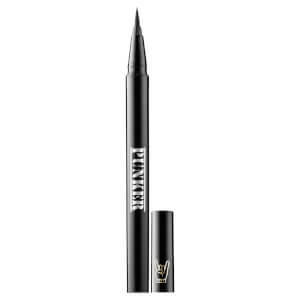 Minimizes excess oil and controls shine for up to 8 hours. An oil-free moisturizer developed for oily and blemish-prone skin. Infused with Retinol, the lightweight, quick-absorbing formula helps to smooth and hydrate, whilst minimizing the appearance of pores and combating uneven texture. A dose of Arnica soothes redness and irritation for long-lasting comfort. Lotion: Massage evenly over face, neck and chest. 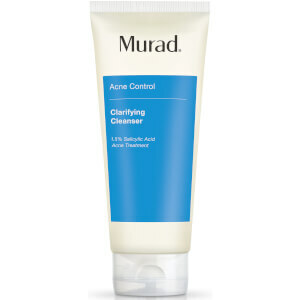 Follow with a Murad sunscreen during the day. Lotion: Water/Aqua/Eau, Dicaprylyl Maleate, C12-15 Alkyl Benzoate, Butylene Glycol, Glycerin, Sorbitan Stearate, Squalane, Stearic Acid, Retinol, Caprylic/Capric Triglyceride, Urea, Yeast Amino Acids, Trehalose, Inositol, Taurine, Betaine, Arnica Montana Flower Extract, Epilobium Angustifolium Flower/Leaf/Stem Extract, Hydrolyzed Soy Flour, Spiraea Ulmaria Extract, Honey (Mel) Extract, Cetearyl Alcohol, Ceteareth-20, Talc, Glycolipids, Sodium Hyaluronate, Panthenol, Lecithin, Avena Sativa (Oat) Kernel Protein, Tocopherol, Magnesium Ascorbyl Phosphate, Chondrus Crispus (Carrageenan) Extract, Dimethicone, Sodium PCA, Allantoin, Sclerotium Gum, Carbomer, Disodium EDTA, Aminomethyl Propanol, Phenoxyethanol, Caprylyl Glycol, Chlorphenesin, Citrus Aurantium Dulcis (Orange) Fruit Extract.